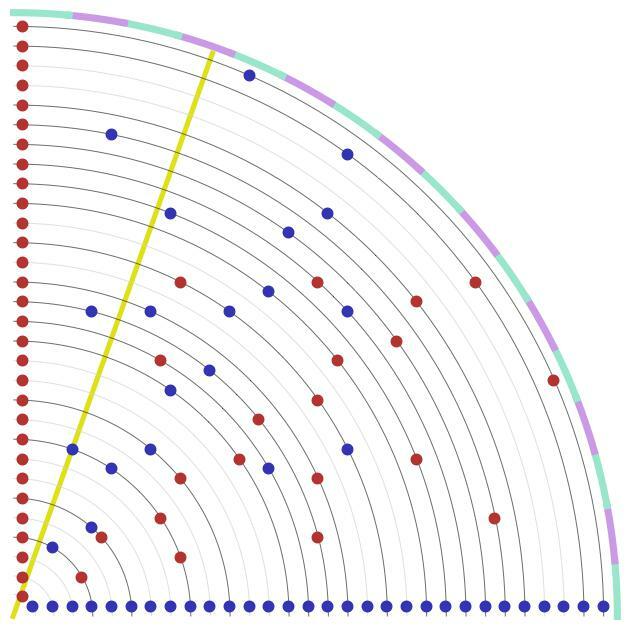 Integer points are just points on that surface that happen to have integer coordinates - and there are plenty of them, for instance (4,7,8), (8,9,12), (14,17,22), (26,15,30) and so on. Since there are infinitely many such points, we will keep track of them by focusing on the circles with constant z (you can see one in the picture in green). 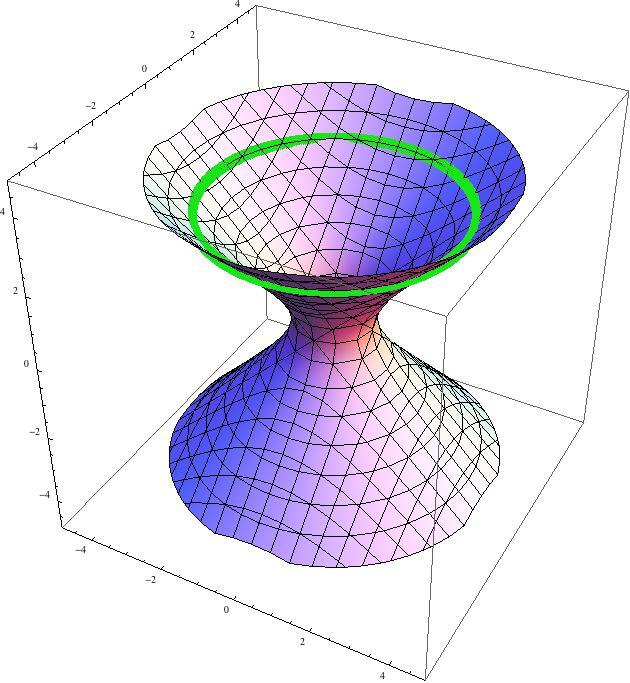 I will call such circles "levels" and from now on will consider only levels with an even value of z.
I am going to project all "even" levels down onto the x-y plane by essentially "forgetting" about the z coordinate. All integer points on even levels have even value of z (by definition) and different parity for the remaining coordinates. When x is even, I plot the point in blue, otherwise I plot it in red. The sketch of integer points on even levels from 2 to 60 is on the next plot. Each point will be assigned pitch and duration (length) as follows: we will project the point (yellow line) onto the green-purple screen at the boundary and read off the pitch from a table we will assign to each experiment below. If the given level contains two or more points (and in higher levels it occurs quite frequently) we will play them in harmony. The length of each tone will correspond to the distance from the previous "non-trivial" level. Since the smallest distance between the levels is 2 - that will corresponds to the shortest length, let's call it L. Everything else will be an integer multiple of this length. For instance the point (6,17,18) on the plot (which the yellow line goes through) intersects the screen at the fourth "bracket" from the left (that determines its pitch) and since the previous non trivial level is 12, we will assign the duration 3L to it. And now some examples of this process for different MIDI instruments. They are played with different tempo and they all start at different levels of the hyperboloid (going up from there). The "Atonal" means I assign the colored sectors on the boundary to the chromatic scale. In the remaining cases, the scale is stated explicitly. The rest of this page will be a temporary home for some music that I wrote in the past. It was created with the electronic help of my first keyboard - Yamaha PSR-500, which was really a toy for kids, but it served its purpose of getting me hooked on piano, so I am not going to say anything bad about it. Most of these pieces were recorded by plugging the headphones outlet of the keyboard directly into a CD recorder, so do not expect too much in terms of sound quality. I am primarily using this webpage as a repository of musical ideas (especially the second series has this character). If I ever learn how to play piano properly, I will remake them on a reasonably decent instrument. A friendly warning: the files below (*.mp3) are fairly large - about 1.5M/min.